Hollywood has pulled out the red carpet and glitzy frocks again, for yet another great year of award nights and glamorous gowns as the celebrities show off the best and worse of what fashion has to offer. In early January, the 76th Annual Golden Globes kick-started the award season off with an A-star list of celebs, being recognised as the best in film and television. Just when you thought that it was all over, shortly followed the 24th Annual Critics Choice Awards and the SAG (Screen Actors Guild Awards); giving us fashion-lovers another round of funky, quirky and out-right gorgeous gowns to admire. This year, Fall/Winter trends definitely had a great influence on our celebrities’ frocks and outfits. We can see lots of textures from beautiful sequined fabric, gorgeous voluminous Cinderella-like ballgowns, subtle lace, plenty of tulle, a touch of feathers and the occasional animal print. Amongst the array of stunning gowns, here are some of our top favourites we absolutely love!! Kiki turned heads in this stunning pale pink tulle frock at the Golden Globes this year. Her gown featured a sheer organza bodice with external boning; a contemporary twist on the corsetry from the Victorian Era and very much a Fall/Winter 2019 trend. This glam season was all about that Cinderella-inspired ball gown and Kiki definitely did not disappoint. A layer of tulle drapes seamlessly across Kiki’s bodice, extending over her arm to give her the illusion of sleeves and add some additional coverage without drawing too much attention away from that extravagant skirt. Multiple layers of tulle were used to create a gorgeous fullness. Once again, some of our celebs opted for the no-train look this year but either way Kiki looked beautiful. Michael Kors shocked the fashion world with this interpretive piece for Emily Blunt’s SAG Awards appearance. The gown caught headlines for its unusual silhouette and frilly shoulder features. Besides all the scrutiny, we absolutely love this gown on Emily and we think she looks incredible! The body-hugging dress showcased her beautiful natural figure and the barbie pink colour matched her complexion perfectly. More so than this, we are truly mesmerised by the heavily beaded fabric that adds a touch of glamour and razzle dazzle to this simple, sophisticated design. Whilst most celebs avoided trains this award season, Emily chose to feature a small sweep train. It’s a great way to add formality to a simple gown without causing too much restriction. This award season, it was all about modest-promiscuity. Lady Gaga wore a stunning Dior gown to the Screen Actors Guild Awards and she looked absolutely divine. Inspired by the classic Marilyn Monroe neckline, Lady Gaga’s 2019 SAG award gown showcased a deep v-neckline with a ruched element on the bodice; adding some texture to the contemporary design. Her gown was made from a stunning Taffeta-like fabric, which illustrates great body and stiffness to create a perfect level of fullness. Like many celebs this year, Gaga opted for a gorgeous thigh-high split, baring her whole left leg. The neckline and skirt hem was finished with a beautiful soft and luxurious feather trim which extended around to the back. To draw attention to her beautiful bodice design, Gaga opted for a sleeked back hair-design which was tied into a neat lower bun. Contrary to her stunning white gown, Lady Gaga wore a deep mauve coloured lipstick with a natural and clean eye-look. She looked truly elegant! Allison looked absolutely stunning in her custom-made Christian Siriano gown for the Golden Globes. She opted for a clean, sophisticated look this year by avoiding the extravagant ball gown silhouettes and heavily beaded laces. The gown is well-fitted around Allison’s bodice and hips, which showcases her beautiful slim figure. It begins to flare just above her knees, and extends into a subtle sweep train; a perfect way to avoid any restricted movement when you’re walking along the red carpet. The Icey blue colour looked absolutely gorgeous against Allison’s complexion and tied in beautifully with her silver and green crystal encrusted necklace. Because of its simplicity, Allison, opted for a beautifully draped neckline which added a slight element of drama and elegance to clean-cut trumpet styled gown. Crazy Rich Asian’s star, Gemma Chan, looked absolutely amazing in her custom-couture Valentino gown. Inspired by the 1980’s mullet, Gemma chose a contemporary high-low gown with incredible fullness and drama. She proved that even a gown as full as hers could be comfortable and functional as she opted to wear shorts underneath, instead of a fitted skirt. The loosely draped bodice extends up to the neck, where it turns into a halter-neck inspired look with a stunning oversized bow at the back which drapes seamlessly to the floor. The voluminous skirt drapes beautifully from the hips and extends all the way into a 1metre train; adding the ultimate extravagance and drama to any glamorous red-carpet frock. The gown was well-balanced with a beautiful open back design feature and high split in the front skirt to add a modest yet frisky element to the overall look. We absolutely loved it! Sometimes you don’t need an extravagant ball gown or heavily beaded lace to look absolutely stunning on the red carpet and Mandy Moore proved exactly that!! She wore a beautiful trumpet styled gown from the wonderful house of ‘Jason Wu’. The fitted gown, flared out just around her knees, extending into a stunning 1metre train. Like most celebs this year it was all about functionality and comfortability, which was evident in the stunning mid-thigh split. Mandy wore a beautiful black satin belt around the waist, which breaks up the gown and adds an extra element. The strapless, long sleeve design showcased Mandy’s beautiful collarbones, drawing more attention to that stunning heavily beaded silver encrusted trim that extended around to her back. With her simple and elegant design, Mandy accessorized with classic thin sliver dangly earrings. Beautiful!! This Fall/Winter was all about the Wild West and funky fringing and Lupita Nyong’o showed us exactly how it should be done. She looked absolutely glowing in her custom-made Calvin Klein gown. 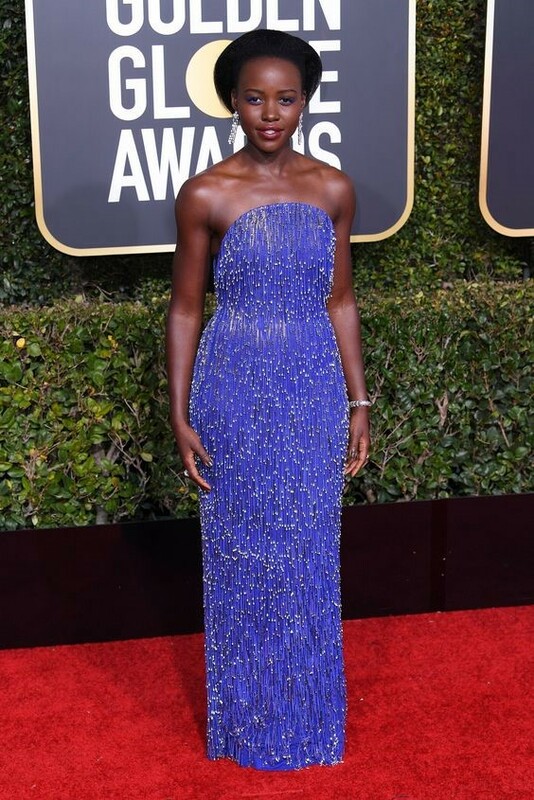 The vibrant electric blue coloured gown complimented Lupita’s gorgeous bright blue eye-makeup and we can’t get enough of it. The fitted body-con styled dress, perfectly showcased Lupita’s figure and the strapless rounded neckline accentuated her collarbones, drawing attention to her beautiful smile. The funky fringing feature extends right from the top neckline to the bottom hem of the dress, adding a fun and flirty element to the gown. Each fringe showcased a beautiful hand-sewn silver encrusted jewel which adds a beautiful shine and glamour to the overall gown. Lupita wore large matching earrings which tied in perfectly with the dress and completed the overall look. Absolutely stunning!! Isla looked like a true real-life princess in her custom-made Monique Lhuillier gown. She went all out with her ball gown styled frock, heavily jewelled necklace, earrings and red lippy. But we can’t deny it, she looked absolutely gorgeous. Whilst she may have used a traditional French Chantilly throughout her gown, the horizontal striped pattern added a more contemporary twist which we adored. The contrast between the lattice-mesh and the lace trim looked absolutely beautiful and the light-coloured fabric underneath this feature was a perfect way to enhance the detailed design of the top overlay. The scallop lace trim along the neckline of the bodice was a beautiful way of finishing the gown. A very modest and elegant dress! Anne Hathaway, as always, stole the spotlight in her gorgeous leopard print evening gown at the Golden Globes earlier this year. Her bodice showcased a fantastic contrast between a two-tone animal print which is a great way to colour-block when working with a patterned fabric. This year was all about convenience and functionality for Anne, as she opted for a gown with no train. Sometimes a simple but stunning printed fabric is all you need to make your custom-gown special and unique. A thigh high split is also a fantastic way to add a bit of elegance and drama to the outfit. It’s also a brilliant way to avoid any restricted movement and we think Anne pulls it off wonderfully! Rachel Brosnahan looked absolutely adorable in her simple, elegant Dior gown. She chose an ankle length hem to show off her gorgeous metallic heels. This glamour season it was all about that soft, beautiful drape. Rachel’s gown featured metres of fine chiffon, layered seamlessly on top of one another to create a full yet soft and flowy drape. Her strapless, ankle length gown showcased a gorgeous delicate French Chantilly lace overlay. The pale blue skirt was a great contrast against the ivory lace as it showcased the detail in a subtle way. The bow straps around the bodice add a contemporary element to this gorgeous traditional lace frock. What a beautiful and elegant gown for the SAG awards. We love it! !